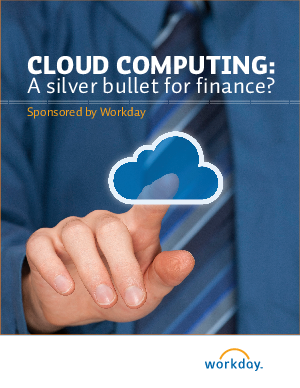 Offers > Workday > Cloud Computing: A Silver Bullet for Finance? The benefits of cloud computing—a high return on investment, greater staff efficiencies, optimisation of IT resources, plus enhanced visibility and access to information—have piqued the interest of CFOs and finance leaders who are actively evaluating the risks versus the rewards of the cloud delivery model. Although a steady migration to the cloud is happening in many areas of the enterprise, finance professionals still have questions regarding the security, performance, privacy, risks and the actual cost and value of cloud computing. Download this whitepaper today and discover the benefits of moving finance operations to the cloud, and how it can drive sustainable ROI.